The main purpose of coal handling systems is to transfer the coal as quickly and cleanly as possible to power plants, steel mills and other industrial facilities. Transporting and unloading are just two stages in the process of moving coal from the producer to the consumer. When transporting by rail, coal must be unloaded from railroad cars. A number of options are available, but the argument always comes down to unloading via rotary dumper or bottom dump. The rotary car dumper is a cost-effective, all-purpose workhorse, and is often the choice for high speed automatic dumping of both rotary coupled cars and random car applications. Cycle times for dumping can be as fast as 35 seconds per car, and tonnage throughput can reach 5,000-plus tons per hour. Unloading rates can be increased dramatically when multiple dumpers are installed, in tandem, triple or even quadruple configuration. 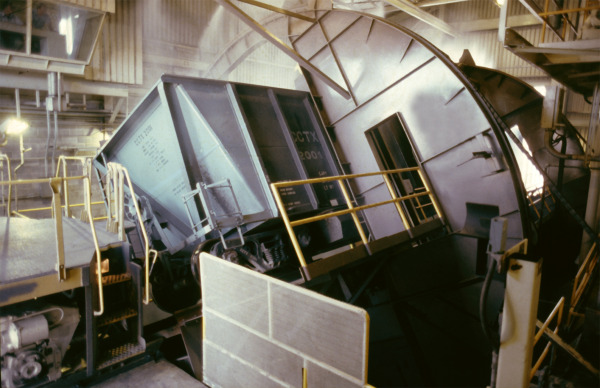 A dumping cycle begins when a loaded railcar moves into position inside the dumper barrel. The dumper cradle begins to rotate, and the mechanical clamp arms descend from their support posts. By the time rotation reaches 15 degrees, the spill truss supports the side of the car, and the clamps have locked on. The car is securely gripped and supported throughout the rest of the rotation cycle. Once the car has reached 160 degrees of rotation, dumping action has been completed. Barrel movement is then reversed and the car returns to its upright position. As this is happening, the clamps release, the platen locks disengage, the platen hooks align the rails with the yard tracks and the now-empty car is ready to exit the dumper. Faster unloading times are realized when rotary dumper installations are matched to unit trains. To achieve the fastest times and highest productivity with minimal personnel, dumpers must be matched to auxiliary equipment such as train positioners, car indexers, traveling hammermills and track systems designed to handle high numbers of cars. When circumstances require it, a dumper can be adapted and customized beyond its standard features to match special site or environmental considerations. This means bulk handling requirements that are even more demanding than the accepted standards for trains and railcars. Choose a manufacturer that carefully analyzes each potential application to establish peak forces encountered during each phase of train unloading. This ensures the proper sizing of drives, arm configurations and wheel chocks. Precise engineering methodology can assure successful operations for many decades to come. The railcar dumper and bottom discharge railcars are the accepted methods for unloading railcars. Selecting between the two systems means that a number of factors must be considered, namely capital costs, maintenance, climate, versatility and economics. Capital costs: Unlike operating costs, which are the daily or monthly expenses related to the routine operation of a power plant, a capital cost is the one-time expenditure incurred in the purchase of new equipment which increases production, and often lasts for years. Capital costs are fixed, and are therefore independent of the level of output, and both systems represent just such an expense. Both methods involve a receiving pit to be dug in the ground with a system of conveyers to carry newly-dumped material to its destination, but the rotary dumper requires a single large piece of equipment, and the corresponding cost for a bottom dump system includes a substantially deeper pit structure with a shaker mechanism. Either system could also incorporate auxiliary equipment such as a train positioning system to carry out the unloading procedure. Read the entire article, Which Unloading System?, in the June 2015 issue of World Coal, Pages 55-59 (or 57-61 in the online flip book). 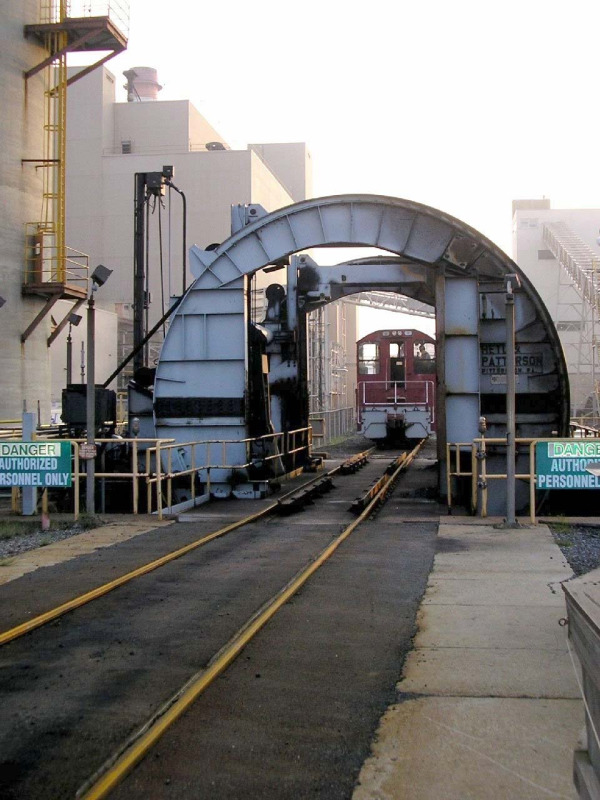 Heyl & Patterson has manufactured bulk material handling equipment since 1887, and has been producing rotary railcar dumpers for decades. These railcar unloading solutions are cost-effective, energy efficient and include built in safety features and multiple mechanical and electrical drive options, while being tailored to each customer's specific needs. Additional customizable options are also available, such as a weigh scale certified by the National Conference on Weights and Measures for strict weighing standards; a hammermill that clears clumped or frozen material in a fraction of the time needed by other methods; and single and multiple barrels -- tandem, triple and even quadruple -- to achieve maximum throughput.